We'll be back at The Emerald Rose in Billerica, Mass., on SAT APR 13, 2019. In the meantime, catch Steve with Chris Fitz every Thursday night at the Jasper Hill -- Acoustic Hoedown in Millis, Mass. The Brickyard, 371 Main St., Woburn, MA. Pizza, burgers -- plus music on weekends downstairs in the swanky bar, part aquarium and part blue grotto, with couches, tables and extensive bar. The Emerald Rose, 785 Boston Rd. (Rt. 3A), Billerica, MA. Live music on Saturdays -- but that's just the start. There's a huge selection of seating (restaurant, booth, or bar) and a terrific menu with Irish standards and straight-on roasts with sides and salads. Friends who come to hear the music come back for the dinner. Jasper Hill, 270 Exchange Street (Route 115), Millis, MA. . Great food, beautiful new location at the historic Van Kleeck building in Millis. Steve Dineen and Chris Fitz appear with guest musicians every Thursday in the popular Acoustic Hoedown a gathering place for blues, rock, and country fans. Friday and Saturday nights feature great regional bands. Boston Bands. Aunt Mimi has been a member since 2007. The site had an overhaul recently and looks great. Search by date, artist or venue. Boston Blues Society. Where to hear blues in the area -- search by date, artist or venue. Open Mike. Find an open mike night somewhere local. HOWL. Music, arts, dining, and culture in greater Lowell -- an easy-to-navigate experience and a great first stop before heading into Lowell. Drivin' Blind. Openers for the likes of Savoy Brown and Sonny Landreth, DB is fronted by Steve Dineen on lead guitar and vocals. Finalists in the 2010 Boston Blues Society battle of the bands. Always a great show! Silverlock. This duo -- Deb and Susanna -- first knocked us out with their covers of early girl-group pop songs. They write and feature their own superb pop originals. Guitar, keyboard and vocal harmony, plus many different musician friends on bass and percussion. Trusting Fate. A trio plus bass covering unusual material from Americana to Peter Gabriel to the Grateful Dead on guitar, mandolin, and keyboard. Great vocals! Craig LaGrassa. Craig is an easy-going singer-songwriter with a seemingly endless repertoire of cover tunes that he performs in his own style. A great solo performer, Craig also hosts some friendly open mikes. Tim Gartland. Tim is a singer and song interpreter, song writer, popular harmonica teacher, and really delightful performer. When he was a local presence, with Tom West on the boogie-woogie piano, it's like night with Bob Dylan and Ray Charles! Tim is based in Nashville nowadays but still makes it north for events in Boston and vicinity. Tim's latest album (2016) is What the Blues Look Like. Kenny Selcer. Kenny plays the most fluid, versatile acoustic guitar in the area, whether performing solo or assisting his many singer-songwriter friends. See him this week -- he's almost always playing somewhere in the area. His most recent release is the album I Simplify. Wendy Darling and the Lost Boy. OK ... under any name or URL, this guitar duo is to SEE and HEAR at the next opportunity. Great up-to-the-minute, out-of-the-way covers and first-class original tunes, plus great arrangements and vocal harmonies. Their musicianship and attidude are a plus. A Mimi favorite!! Brittany Hill Brittany has the sweetest voice imaginable, whether she's singing country, folk or rock, plus a wide repertoire. She fronts a number of bands with and sings in acoustic duo at the Concord's Colonial Inn every month. Don't miss hearing her while she's still local! The Rampage Trio "High Energy Blues Rock Boogie" ... a ton of music coming from just three musicians. People are dancing every time we see this band, whether they're playing Grand Funk Railroad, Donovon, Tracy Chapman, or Motown. These guys play with finesse but it's a gutsy sound for all that. Plus harmony vocals -- catch them at Main Streets Market in Concord. Creek River String Band Tight and professional, with originals you'll mistake for traditionals, Creek River is consistently entertaining band. Roots music can mean a lot of things, and this band covers them all from Appalachian to honky-tonk. Musicianship and singing keep Creek River's sound varied. Really recommend this band for any occasion or acoustic venue. The Harmonators. Long-time performers at Arlington's Jam'n Java Open Mic, this trio brings harmony singing to songs in the pop rock genre. With a great variety of tunes, The Harmonators bring a comfortable, living room feeling to their gigs, whether in bars, restaurants or outdoor events. The Social No. 11. Boston area's latest addition to the roots music genre, these seven musicians are creating original music with an old time feel, and are getting noticed. Made for long dinners, session ales, and outdoor festivals, The Social No. 11 incorporate accordian, fiddle, dobro, and percussion in their overall sound. Everett Pendleton We've caught Everett's acoustic act where his stellar vocals and easy guitar playing bring songs to life -- everything from Bill Withers, to Billy Joel, to Breakeven, to Van Halen ... He also plays in various groups, including the out-and-about-town Loomers. Clearly a lover of songs, Everett will win you over easily. Catch him at Billerica's Emerald Rose among other metrowest pubs. Brian Burrill Brian plays in metrowest including Waltham, Watertown, Newton, and Dedham. This is a strong singer with a great range and mastery of pop and rock ballads, country, and new stuff too. Solo, Brian more than fills the sound and stage, a real steady, entertaining performer, whether he's covering Neil Young or Tears for Fears. You can catch him as well with the band Sudden Relic. The Belltones. Think you've heard it all when it comes to classic rock? Think again, because the Belltones bring it to life with terrrific, engaged vocals, tight drumming, free-wheeling bass playing and bright, groovy guitar. These guys are all about the audience -- absolutely check them out. Wendee Glick. Wendee is a jazz pro with terrific voice and friendly, no-worries stage presence. She knows her way around the standards and makes every song her own, pitch perfect and personal. Mimi fans: catch Wendee at the Colonial Inn where she performs regularly with Steve Heck on piano and David Clark on bass. Intuition. This women's barbarshop quartet have an extraordinary way with modern pop and works from the great American songbook. They are starting to perform regularly. Amanda Cote. No excuse for not catching Amanda -- she's booked most nights of the week! Whether playing solo or with the Amanda Cote Project, she's original, soulful and varied, with a terrific vocal range. Covers and originals, no problem. Catch Amanda in north and central Massachusetts, as well as New Hampshire, and watch for her new CD in 2017. Ben Knight. Ben is a hard-driving phenom pianist with command of his playing, great taste, and vocal chops on top of that. Whether sitting in with different groups or fronting his own Ben Knight Band, he provides a night of real entertainment. Catch him in Massachusetts and New Hampshire -- or on YouTube! Chris Fitz. Chris is playing out solo, with the Chris Fitz Band, and at the famous Acoustic Hoedown at Jasper Hill Cafe in Holliston, MA. At the core of all these performances is Chris's soulful singing, skillful guitar playing, and song composition. Evidence of all three? His latest recording Basement Musings, one of the best self-produced albums we've heard in years. Get out to hear him soon! Butler Frogs featuring David G. Moore and Chuck Clough on guitars, Tim Fiehler on bass, Greg Mara on percussion. Fans of vocal harmony, funky old time jamming, The Dead, the Kinks, Bob Seger, Peter Frampton, etc., will love this friendly band. The Low In Between. Powerful, resonating guitar music in an alt-country vein and given real distinction by Rich Podgur's dead-on singing and original tunes. The rhythm section rocks and the Telecaster leads aim to blow your mind. Have a listen. Tom Yates and the Workingman's Band. Tom plays guitar with different groups of friends, including the Workingman's Band, with Mike Avery on drums and Rick Maida on bass. A clean, hot player -- and the song always comes first. Totally recommended! Randall Kromm. Randall's easy-going song styles are perfect for the whole family, and that includes the adults. He has performed in Boston for years, solo and with his children. We really recommend hearing this winning guitarist and singer -- you'll be thinking over his lyrics all the way home. Rich Eilbert. Rich has performed throughout Metrowest for years, and hardly a gig goes by with a new original song, often topical and humorous. A great supporter of other musicians, he hosts the open mike at Lincoln Library (LOMA) on the second Monday of the month, September through June. Live Wire Super-fun cover band on the funky dance side, great vocals, commited musicians, long-time scene-sters. Catch them at Main Steets Cafe, Concord, MA. Bucket of Blues. A blues and r'n'b band with its own sound -- or sounds?? With five great players, each a master with his own style, this band is always full of surprises and always a great night's entertainment. Catch them at Laurie's 9:09 in Wakefield or The Farm in Essex. Grand Theft Audio a semi-acoustic act specializing in classic rock (Doors, Allman Brothers, Skynyrd) but ready to cover a Monkees tune like "Pleasant Valley Sunday" when necessary. Regulars at Woburn's Brickyard. Bare Hill. Electric and Acoustic Rock and Roll with Sweet Harmonies. Caught these guys at Main Streets Market, Concord, at closing time -- except no one wanted to leave. Six to sixty, everybody was up dancing. Six musicians with keys and drums, but the volume was completely within reason, and the band had a full sound, tight and in the groove. If you need a fun night out, this band is totally recommended, whether you like Sly Stone, John Fogerty, or Warren Zevon! Sugarbone. The vocal blend of this ensemble, their musicianship, and their easy-going performance style are not to be missed. Best of all, they are frequent performers at Concord's comfortable Main Streets Market and Cafe. Come hear them transform pop hits and folk tunes like you won't believe! In the ensemble are Seth Connelly, Jackie Damsky, Peter Tillotson, Eric Kilburn, and Keith Jacques. Alan Goodrich. Six nights a week, Alan is performing somewhere, whether leading Alan Goodrich and Friends at the Colonial Inn, hosting the Beatle Brunch at The Burren in Somerville, or playing with the band Alan and the Alligators. Eye to eye with his audience, Alan uses his rhythm playing and vocal range to put across a great variety of covers and his own original tunes. Saw him pull Steve Miller's "The Joker" out of a hat on request with the Friends falling in line behind him -- Alan aims to please! Road Trip. Ellen Katz is the singer in this BTTW rock band, covering rock, soul and blues from the 70s and 80s to today. The whole band sings, providing great harmonies. Musicianship and a tight sound set these guys apart -- get ready to dance! Bill McGoldrick Duo with Danielle Jean. Bill has been playing the greater Boston area for years, always with a strong female vocalist. He and Danielle put across everything from sixties soul to last month's techno-pop dance hit; if it's music, they do it! With many guitar influences, from seventies rock to jazz and fusion, Bill's playing and arrangements are strong on every gig -- but he and Danielle play to suit the audience of the night, whether they are looking for a quiet evening of slow numbers or one rocker after another. Martin Grosswendt and Susanne Salem-Schatz. Country blues, classic honytonk, great vocals and feel. They teach and travel, so check their schedule. Yoke Shire. Hard to find two nicer musicians as Craig and Brian Herlihy, the brothers at the core of this Celtic music ensemble. These two alone combine harmony singing on their own arrangements of traditional and pub style Irish music with musical performances on a range of instruments that includes guitar, bass, keyboard, harmonica, melodica, and more. Beautiful staging, quality production and a truly live feel makes them a great act to catch anytime and with friends of all ages. Marty Beecy. With or without his Tom Waits-style band the Rogue Loons, Marty is an original talent, a songwriter with a distinct perspective and memorable phrases. There's a tender side to Marty's songs, despite the big sound. Great side players are assets but Marty brings and holds his audience. Check them out soon. The Undercovers. Two guitars, bass, and drums; classic rock and roll with plenty of '60s and '70s tunes; harmony vocals; and terrific rock guitar playing a la the Kinks, the Fortunes, Creedance, the Stones and the Mindbenders. This band has mastered the true rhythm and tempo of the first and second rock waves -- feels like riding with the top down. Totally recommended. Oen Kennedy. Voice, playing and most of all, songwriting make Oen's performances memorable days and weeks later. His easy style and clear-as-a-bell singing remind some folks of James Taylor, but his perspective is all his own -- and positive. Metrowest is lucky to have this dedicated artist. Dan Margarita. Dan is a regular at area open mics -- but you simply never know what to expect when he gets up. His background in comedy shows in his songwriting and his delivery -- there's a touch of Phil Ochs -- but Dan's human nature keeps the listener's smile there well after the punchlines. Plus you'll get a straight Beatles cover from time to time! Albums include Kill the Messenger and Almost Pregnant. Soul Collective - Featuring Jennifer Truesdale. Jennifer performs in the Forge Room at Concord's Colonial Inn, often backed by a bandmate. Her vocal talent and range of material win folks over right away. Catch her at the Colonial or singing the occasional gig with guitarist Bill McGoldrick. JaynJoe. JaynJoe cover more recent material in perfect harmony -- a smooth sound but always their own arrangements, all totally live. Some excellent orignals sneak in as well. Catch them at Bistro 44 in Bedford or Tanner's Tavern in Woburn. Outrageous Fortune. An outstanding 1930's style folk and jug trio, just guitar, harmonica, jug, and vocals. Point of VU. Feel like dancing? Point of VU is playing somewhere in eastern Massachusetts or southern New Hampshire with a completely professional sound and vocals by all four members. Funk, soul, and best of all hits from last week! These guys transformed Saturday night at the Radisson Chelmsford when we caught them there. See for yourself. New Watch City. 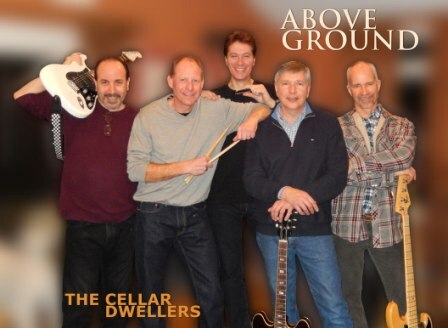 Waltham-based, these guys and gal cover an interesting musical landscape -- many decades of rock music, all danceable, with a rough-and-ready '80s vibe. Fun, approachable, ready to please -- and an awesome Close Encounters-style watch-in-profile logo! Blue Light Bandits. These extraordinary multi-instrumentalists, harmony vocalists, arrangers and songwriters are some young guys currently out of Worcester. As current as their sound is, the attention to musicianship and performance is great to see. Hear them now locally while you can -- next stop is national. The Mojoleros. A Falmouth-based ensemble -- at its core are Jonathan Larkin on button accordion and vocals and Amy Larkin on fiddle playing Cajun, Zydeco, and Latin Dance. Years ago, Derm gigged with these guys under the name Buzzard's Bayou. Ashmont Station. Ginny and Dean Johnson's modern country band play all over New England as well as in national competitions. Great vocals and a tremendous mix of old and new country. Rockland based. Kirsten Manville. Singer-songwriter and interpreter of folk and country, Kirsten performs as a solo act, and as one half of the duo Kirsten & Dave. We love Kirsten's clear voice on the old tunes. She is also an accomplished flutist. Jon Waterman. Jon has a great knowledge of old and new country, with guitar, voice and chops to match. Check out his website: "Singer and songwriter Jon Waterman writes and performs an earthy, gospel tinged blend of blues, roots rock and old time jazz. His lyrics often feature storytelling, and his music has a retro quality, influenced by the styles and sounds of artists such as the Rolling Stones, Gram Parsons, Hank Williams Sr., Johnny Cash, and CCR." Cellar Dwellers. An up-and-coming blues band playing Eastern Massachusetts. Bass, drums, guitars, harmonica and vocals - what else do you need?! Jim Waugh. If you've played an open mike anytime in the past two years, Jim was probably performing too! He's new to the scene with a style all his own, just beginning to feature. Tommy and the Rats. Thomas D'Amour writes modern country songs that seem off-hand, humorous, and haywire -- and that you'll be pondering long after the bar's closed. His backing assemblage are the Rats, but Tommy's own high-energy acoustic playing is white lightning enough. An original artist well worth the trip. Amanda McCarthy. Amanda's sings plenty of new material but her voice will remind you of Linda Ronstadt, Trisha Yearwood ... see her now while she's local. Rory Scott Band. Today's country with Rory's superb vocals and a band of musicians who know how to deliver. Catch them in Manchester, NH. Coo & Howl. A musical collaborative of Boston band veteran musicians who produce a unique style of music blending folk, psychedelia, blues and classical. Hear for yourself on Bandcamp. Joey Edwin. Ok -- next time you're in the Chicago area -- guitarist and singer Joey Edwin can deliver the music for any occasion or event, whether as a solo act or fronting a duo or trio. "Latin Rhythms & Pop Grooves" -- an up-to-the-minute repertoire and professional talent. Big Ray & Chicago Most Wanted. Out and out blues band, caught in the act at Chicago's House of Blues. Every member at the top of his game and a getting the show across. Highly recommended. Tim Wechgelaer and Chris Carey. Next time you are in in the Saratoga Springs, Glens Falls, Lake George area, don't miss a chance to hear Tim and Chris together or in the their separate bands (Big Medicine and Rodeo Barons, respectively). Catching the two of them at Davidson Brothers brew pub in Glens Falls was like an evening with George Strait and David Rawlings -- except that leaves out the fiddle tunes, Irish songs, mandolin work, and John Prine requests. Wherever they're playing, be ready to park yourself for the night. Rich Ortiz. Was lucky enough to catch Rich Ortiz trying the hall out for a song he was to sing for his sister's wedding at the Queensbury Hotel in Glens Falls, New York. Just him and his guitar, nothing else needed to endorse him fully and hope I get a chance to hear him for an evening next time I'm in the area. An opener for artists as diverse as Ludacris, The Wood Brothers, and Chicago, his solo presence is strong. His 2010 album is Face of a Lion. Catch him while you can in the Saratoga Springs, Glens Fall area. Ryan Whyte Maloney and Cali Tucker. These two finalists from The Voice teamed up in Las vegas and are a powerful duo covering many styles of music, arranging incredible mash ups, and singing like you won't believe. Fun and down-to-earth, Ryan and Cali provide plenty of entertainment and musical chops and awareness that'll keep you thinking after the reverb fades. There's a core of country here along with a nice selection of songs. Chris Nauman. Chris writes and performs his own songs and can be heard in California now after his move in 2017.